My trip to Jamaica didn't include a fancy resort stay or any other luxury delights but it has been the third time I travelled to this beautiful island and just like my previous times it was amazing as always! Don't forget to bring the right clothes when you're packing for your trip to Jamaica because there is an incredibly high humidity which can be a nightmare if your suitcase is stuffed with jeans and long sleeves..Also a good thing to do is to take vaccinations for tyfus and hepatitus. Once you're in Jamaica keep in mind to always wash your fruit and vegetables and be aware of other dangers like drinking bad water. The days in Jamaica might seem to pass pretty slow but in reality you have to hurry to enjoy your share of sunlight because sunset can be at 4 pm! Just wake up early and get the most out of your afternoon because chances are high you will be getting some rain too and believe me, its three years I'm going to Jamaica now and I can set my clock on it! The evenings are really relaxed in Negril and besides enjoying a a cold drink on your veranda there won't be too much to do here. Prices aren't too bad either considering the cost of a drink is 15 cents..Obviously they will charge you a lot more in the local bars especially when they know you're on a holiday but if you're on a budget Jamaica can be a great travel destination. The same thing counts for the food and you can get a great meal for almost no money. On the amazing island of Bubi Kay we had some fresh lobster for 100 Jamaican dollars! Of course Jamaica isn't all about great food and stunning beaches, you will love the Jamaican people as well. They are so friendly and helpful that you really can take it easy because they will help you out with whatever you need. 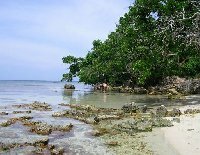 Did you enjoy Third trip to the Paradise of Negril and have you been on a holiday in Negril, Jamaica? Pink Jamaican sunsets around 6 pm! Liked: The beaches, the food, the people!